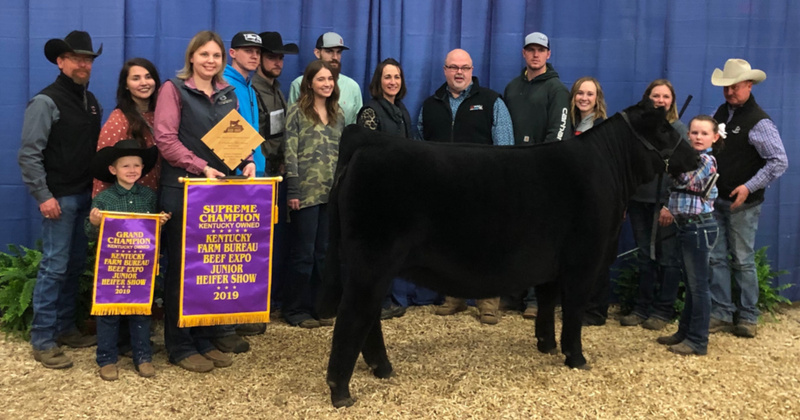 LOUISVILLE (March 8, 2019) – The Kentucky Farm Bureau Beef Expo recorded total sales of $896,402 in its 33rd running March 1-3 at the Kentucky Exposition Center. With one less breed and 30.25 fewer lots than last year, Beef Expo sales averaged $2,150 per lot for 417 lots. Angus cattle brought an average of $3,271 per lot to lead all breeds. The sale topper was an Angus cow consigned by Burks Cattle of Park City and sold for $11,000. Fourteen states were represented at the sale. In the junior show, 343 cattle passed through the show ring, including 205 from Kentucky. The judging contest attracted 163 participants.